Seems very expensive to actually get going, and costs a lot to begin with. Too many removal effects exist that get around his protection as well. Pickman's ability to eat and poop ghouls is the only ability that works with the ghoul subtype.a lot of the best ghouls are rendered useless by day, when facing a day build this can give an additional way of getting those otherwise useless icons into play. I would love to run this in a deck with snowmobiles. I played a game recently where I had RUP (Ghoul version) and Shuggob on the table. Both are obviously unique characters. I played Untimely Burial, chose to put another copy of Shuggob into my discard pile, and then planned to attach him to RUP. Unfortunately, my opponent and I checked the rules and concluded that this was not a legal play because it violated the rules on uniqueness. So, I went back and chose a different character to put into the graveyard (it was just a friendly game). Anyone run across any similar situations? I think we played it right, but there's still a sliver of doubt in my mind. By the way, this card is a boss. Just like Shuggob, RUP offers a printed icon (Investigation) that no other Ghouls can match. If for no other reason, both Shuggob and RUP are must-includes in any self-respecting Ghoul deck, IMO. Yes, Neutral **** Pickman is the God of Ghouls. I have often had him laughing in the face of Ancient Ones. Jesus, I didn't know this site had a cumstumper. It edited out a nickname for "Richard" in my previous comment. On the bright side, there aren't actually any cards that use the name ****, so the intrusion is minimal. Of course, if you wanted to share your famous family recipe for spotted ****, you'll have a hard time of it. 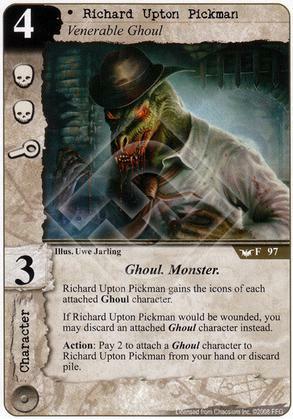 I previously asked about attaching a unique Ghoul (Shuggob) to Richard Upton Pickman. It seems like this would preclude a player from playing (or even attaching, for that matter) a second copy of Shuggob. My question now is about Shuggob's text box while he's attached to Pickman. I assume Shuggob's text box is treated as blank? The same goes for Twilight Cannibal and Ghoulish Hag. If their text boxes were in effect while they were attached, a single Day card could come in and wipe them all off of Pickman in a single stroke. That would make me sad. Can I please get confirmation that the text boxes are treated as blank? Thanks! For the purpose of all other card interactions (excluding interaction with the card that initially caused the attached condition), the card loses all of its original characteristics (such as skill value, icons, subtype, and text box). The card retains its title and uniqueness, and if faceup also retains its faction and printed cost. You were correct about the text boxes being blanked. Good thing too or life could get quite messy quite quickly. You and your friend were also correct about the uniqueness problem. They still have their names so you can't have two attached or one attached and one in play.